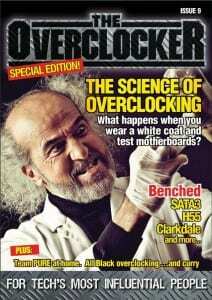 The newest issue of The Overclocker Magazine has been released. This online publication is the “world’s first magazine dedicated exclusively to overclocking and binding the world’s overclocking communities together.” Our very own Deanzo is interviewed in this issue and the Science of Overclocking is explored. Next Article A Call to Arms: Overclockers Forums HWBot Assault!